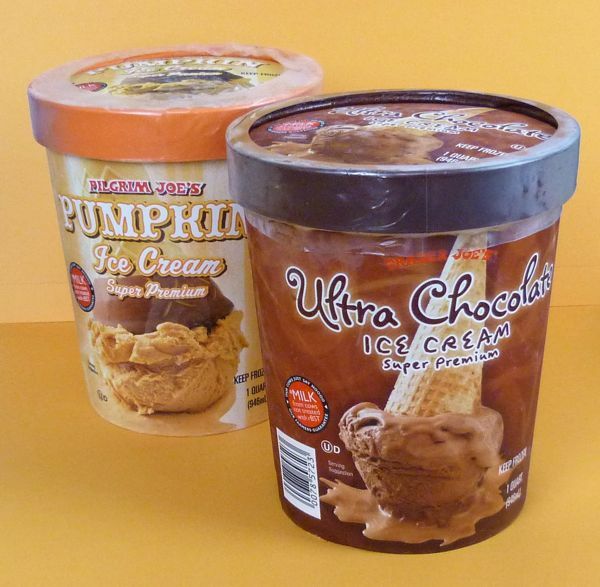 A mixture of two "Super Premium" ice creams from Trader Joe's (Monrovia, CA) -- Ultra Chocolate and Pumpkin -- tasted slightly better than the two flavors did separately. 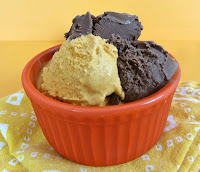 The Pumpkin ice cream by itself was a bit sweet and unremarkable, but when used in moderation with a larger scoop of Ultra Chocolate ice cream, the resulting spicy chocolate flavor was quite nice. 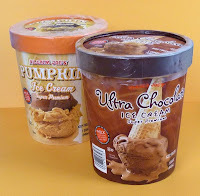 The Ultra Chocolate might be a good mix with cherry ice cream and other flavors as well. Top this ice cream with some caramelized nibs and chopped almonds, and you have yourself a tasty fall-themed ice cream treat. Today was Day #5 of Chocolate and Pumpkin Theme Week.